Honey is a perfect food- as soon as the bees finish with it. But as a natural food, we sometimes feel that we need to take too many precautions with it. To preserve it’s natural goodness, you need to know how to store raw honey. Your best intentions may lead you to do the absolutely worse things for your honey! You do not store your honey in the refrigerator, do you? Whew… I hope not. 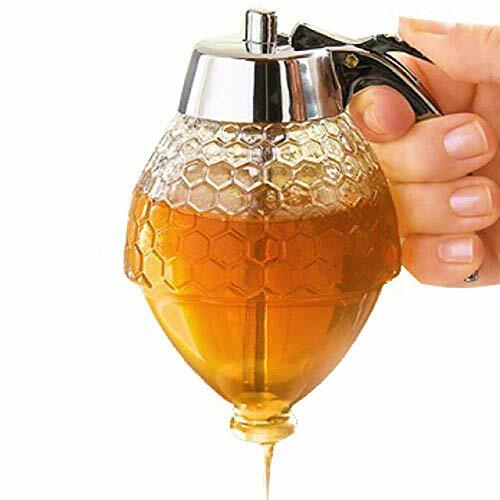 This Honey Dispenser has a tight sealing stopper and lid. Great for a family with kids (young or older) that are prone to being messy. 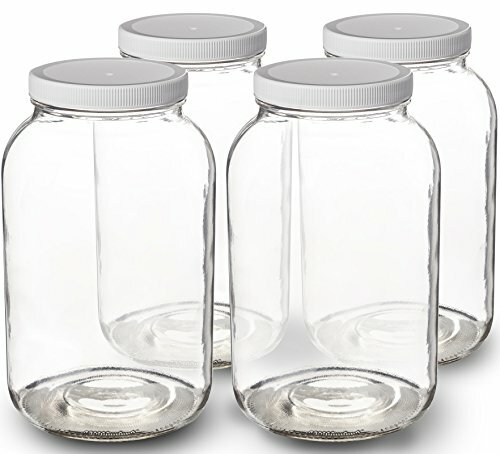 This type of container is a perfect companion to larger storage jars. Its a great way to serve honey in smaller amounts. If you buy raw honey, it may become gritty and solid over time. Gritty honey is not spoiled but it often concerns the user and is mistaken for being spoiled. It is not – don’t throw it out – more on this in a bit. You are in luck if you have a hobby beekeeper in your area. Because, the best raw honey will come from small scale beekeepers. Why? Because we can focus on each jar much better than a large producer who sells thousands of jars a month. And, because small-scale beekeepers sell less product, they usually bottle the honey themselves. Your jar of honey travels through fewer hands to make it to you. Once you find and purchase real honey, you will want to learn the ins and out of proper honey storage. Choose a small producer if you are unable to find a local beekeeper. They will usually have the most pure honey products. If you find that your jar of raw honey has turned gritty and sugary – don’t be discouraged. If most natural honey “turns to sugar” in time, how can those supermarket bears be so beautiful and clear? How indeed? More on that to come. Once you have gone to the effort of buying good quality honey, you want to store it in the best way. This is especially relevant to those of you who want to keep your honey in a liquid (pour-able) state. This is where we have to talk about honey storage temperatures. In order to understand why honey storage temps matter, we must first have a better understanding of raw honey. Real honey is made by bees. It is the perfect food for long term storage in a bee hive. Then, we humans come along and sometimes try to improve it. In addition to enjoying the good aspects of honey, we want to be able to mass produce it and store it on a shelf in a pristine state. Consumers desire that perfect jar of golden honey. The practices used to create a beautiful product for the grocery shelf are not necessarily kind to our nutritious honey. While honey will be safe to eat for a long time, it can darken in color and become more solid. That’s doesn’t look pretty on the grocery shelf so some honey packers use intense filtration. Large commercial honey packers often push honey through a filter under pressure. This is done to provide a beautiful product that will look good on the shelf for a long time. 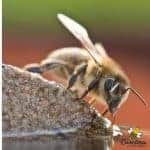 This creates a problem because ultra filtration removes some of the micro-nutrients and pollen in honey. Thereby, lessening the nutritional value of the product. But, you don’t have to be a slave to modern processing. Local beekeepers across the US produce “table honey” each year. Yes, it will cost a bit more – or should. With proper harvest and storage techniques, we can enjoy all the natural goodness of honey and not waste any. If you want to guarantee yourself access to the freshest honey, consider having a couple of bee hives of your own. This beekeeping kit from Mann Lake is a great product for any prospective beekeeper. This company has a reputation for quality products. But, be aware that bees require proper management like any other type of livestock. Be sure that you educate yourself and have the time and money to spend on beekeeping before getting your first hive of bees. I have a great online class if you want to learn more. Raw food products are in their original form as created in nature. Nothing is added or harmed in the components of the product. Honey can only be called “raw” if it has not been processed or super filtered and never heated. The honey should not be exposed to any heat (hotter than it would be inside the hive on a hot Summer day). Using an extractor to remove honey from the comb is okay – it just slings the honey out. Allowing honey to drip through a sieve or strainer is okay as no pressure is applied. Learn more about using an extractor – here. Raw honey is unique. The color and flavor will vary from year to year. Why? Because each season the different flowers may or may not produce that same amount of nectar as in previous year. Nectar production is closely tied to weather conditions. In my bee yard, it is not unusual to have one bucket of honey that is very light in color and another very dark. Read this post to learn more about raw honey. 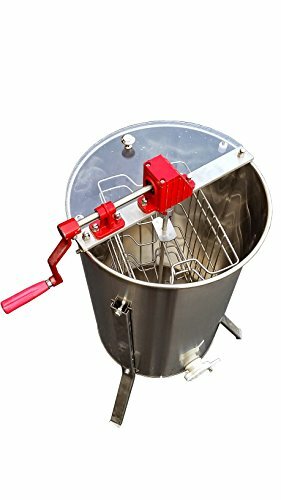 This is a manual Honey Extractor. 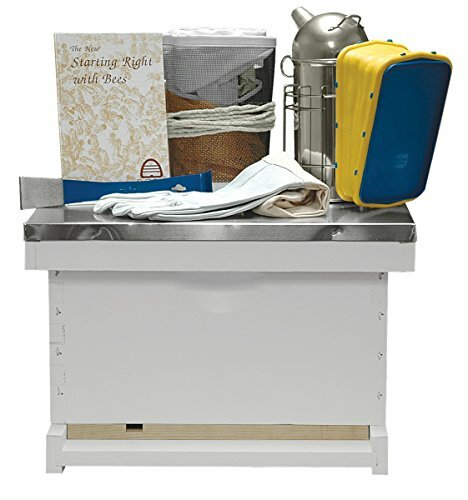 Used properly, this type of equipment does no damage to the beekeeper’s honey harvest. Liquid honey is slung out of the honeycombs and collected in the bottom. Extractors are available in many styles and sizes. Properly stored honey never spoils because bacteria doesn’t grow well in acidic honey. The best way to store raw honey is in a tightly sealed jar kept at warm room temperature. Because honey can absorb moisture and odors – please don’t re-use an old pickle jar. Unless of course, if you are wanting to add a bit of pickle aroma to your raw honey, that’s your call. Using large-mouth glass jars, is one of my favorite methods of storing honey for long term use. The glass is easy to see through, and does not give the honey any strange tastes. If the honey thickens over time, the large opening makes it easy to scoop out. These large containers will hold a lot of honey but are not too heavy to lift. Smaller amounts can easily be transferred to a serving container. How do you store raw honey in the dark? The easiest method is to place your jar of honey in a room temperature cabinet. An ideal temperature range of 70° F – 80° F is best. ( I break the rule and store a small jar of honey right on my stove top. – I am a rule breaker that way. ) Any “tight sealing” honey pot or container is okay. Does Raw Honey Need to Be Refrigerated? No, no, no. Pure honey will not spoil. It does not require cold temperatures or a vacuum sealed jar. Please never put your honey in the refrigerator. It will not make it last longer or keep it fresher. Putting honey in the refrigerator can promote some changes that you do not want. Raw Honey Crystallizes – It’s Natural! This is a common cry among consumers who do not understand the nature of raw honey. The turn often used is “my honey turned to sugar” meaning that the honey has thickened. This is a natural process! Honey is a super-saturated sugar. When honey goes to this solid state, we call it crystallization. The rate of crystallization depends on the nectar sources of the honey, storage temperature and other variables. But it does not mean that your honey is spoiled! People ask how to store raw honey to prevent crystallization. The answer is that sometimes you can not completely stop crystallization. Raw honey contains pollen, tiny bits of wax etc that encourages the change to a solid. Because cool temperatures quicken the process, the refrigerator is the last place your honey jar should be kept. Honey that is stored in the refrigerator will crystallize faster. But if you put your jar of honey in the frig, that’s okay it is still good. Just maybe a bit gritty! Crystallized honey is okay and safe to eat. But most people want their honey to stay in the liquid non gritty form. If you want to change your gritty honey back to liquid – read my post on crystallized honey here. Do you enjoy chewing on honeycomb? Some folks enjoy chewing on a piece of beeswax honeycomb. This is true whether you are a beekeeper or a honey consumer. Though not as common today, you may still be able to purchase a jar of honey with a piece of comb. First the bad news, if you have a piece of honeycomb inside your jar of liquid honey – it will crystallize faster. Solution? Eat it first! But, what if you have several pieces of honeycomb that you want to save for later. This is common if you are a beekeeper or perhaps you want to buy a few frames of honeycomb from your local beekeeper? The best way to store honeycomb long term is in the freezer. I love my Food Saver. It is good for so many uses around the farm. And it is a great way to seal honeycomb in preparation for freezing. One option for honeycomb is to cut your sections of comb into smaller manageable pieces. Wrap tightly with foil or other type of wrap to seal out moisture. And carefully place in the freezer. Even better, you can cut the comb into smaller pieces, place them on a plate and put them in the freezer. Once frozen – use a food sealer to vacuum pack each section of honeycomb. 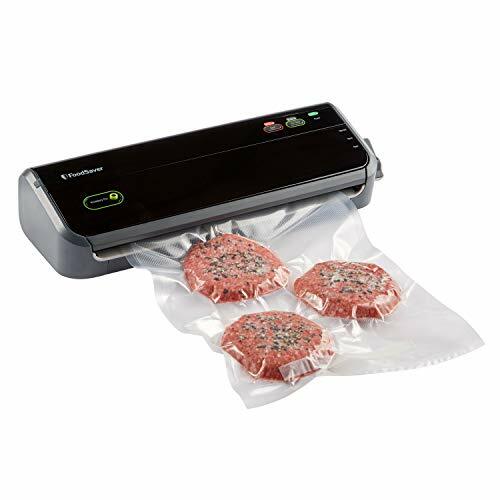 No ice crystals will ruin your food when stored in this vacuum sealed bag. Now you can remove small amounts as you would like. A few hours on the counter and your honey will be ready to enjoy. Did you know that you can freeze liquid honey? I know it sounds crazy. But, freezing is a good storage method for honey that you don’t plan to use for a long while. I don’t normally go to the effort because honey stores so easily on a warm shelf. But, this is an option. Honey can be stored frozen in the comb or place liquid honey in a container with room for expansion. Freezing protects the integrity of your raw honey. Honey can be frozen for several years. When you are ready to use, thaw honey at room temp in sealed containers. Do not thaw honey in the refrigerator-we want it to come to room temperature quickly. What if you are not a honey lover but want to keep some on hand? Freeze small amounts of honey in ice cube trays and then seal them in plastic bags. This makes it easy-peasy to take out just a small amount for use. Even those of you who are not honey-lovers, may enjoy just a bit of honey on occasion. 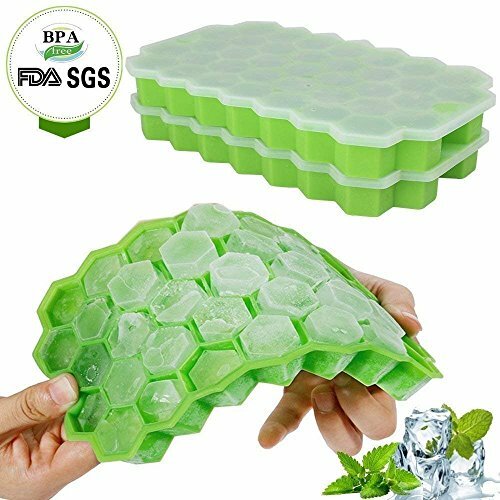 Use silicone trays to freeze small amounts of honey. A great way to seek relief for sore throat pains or coughs, just pop out a frozen “honey-cube” and put it in hot tea. The value of pure honey makes it important to learn how to store raw honey properly. And finding small farmers markets to purchase directly from the farmer increases your chances of getting real honey. Expect to pay more from smaller producers. But no mater where you get your honey there is one thing to remember. You do not have to store honey in the refrigerator after opening the jar. Pure honey will last a long time. Find a dark warm place to store your honey jar and it will be ready to add to your favorite dishes. But, if you do have crystallized honey – don’t panic. Your honey is still safe to eat – it has just changed form. Just love your chats. Your easy way of chatting, your knowledge and tips. I curl up and read them immediately. Thank you Wonder Women Carolina. Thank You that is so kind. I bought honey in West Virginia 3 years ago at least . Eat honey but thought this was gone so today I find it in pantry. It has crystallized and has no smell. Is it okay to use . It was opened prior to storage. As long as it does not have a fermented smell it should be fine. Honey stored in an air-tight jar will last for a long, long time. You dont have to refrigerate after opening. I have a gallon sized can, not jar, of 100% pure honey. I was told at the time, that it would last forever. Is this true? It is approximately 45 years old. Have been keeping it for food storage, but noticed can has some rust on it. I need to move into jars, but don’t want to, if it is bad. (I know 20/20 hindsight tells me I should have done that many years ago.) I believe it has always been stored inside in moderate temps. From what I read in your article above, if it appears and smells good, it is ok. Am I understanding this correctly? Other articles I’ve read have said honey contains spores that can cause botulism, is this true? Thank you for any insight and advice you can offer. Yes, honey MAY contain those spores but so does any raw food. I would say that your honey is probably just fine. My only concern is that since it is in a metal can – have the acidic honey caused any problem with the metal? I honestly dont know. But if it smells good and tastes good you are probably okay. What are the changes that occur to raw honey when stored in the refrigerator?? In summer I often have ant issues and recently started storing my raw honey in the fridge to prevent the ants from getting to them. Honey stored in the frig goes through the crystallization process faster. It wont “harm” your honey but it will (depending on the nectar source) crystallize faster in the frig. What is the best way to remove honey from a fresh honeycomb? Once I remove the honey, then I need to put it In a sealed tight glass container like a Kerr pint canning jar with a lid and seal, right? We just had a hive removed from our yard last night, and the beekeeper, who did the removal, gave us 2 honeycombs filled with honey. Oh that’s exciting! If you want to have the liquid honey instead of comb, look at my harvesting post as it gives some ideas for when you do not have an extractor. What about botulism with unfiltered and processed honey. How do you approach this topic with out freak out..I have found that most adults tolerate botulism because our intestinal tract is mature and allows the botulism to move through before toxin develops. More than ten years ago my son went to Bulgaria and bought me a small clay pot of honey. The pot is very pretty. I have not even broken the seal. If I did would it still be good?? My ex and I had a bee hive many years ago. Thanks from one Charlotte to another!! Hi Charlotte! As long as the honey is real honey and the pot is sealed against moisture – yes, it should be just fine. Now it may taste stronger but real honey doesnt spoil. Fred, I would think that microwaving is very damaging to your honey. The way in which the unit creates heat would surely damage some of the nutritional properties. I know it is slower to have to do it the gentle way but it would be best. I have some honey frames with a mixture of capped and uncapped honey still in them. More uncapped then capped. Can I place in freezer and reuse in super in spring to start new honey season? Also how do you feel about reusing the comb on frames year after year. I see some people do and other start fresh each year. New bee keeper trying to learn what’s best! I am thinking seriously about trying beekeeping. my question is on an average medium or large supper how much honey is generated average . and how often do you check the hives, besides setup and harvest how much work is involved on our part. Hi Jayson, I hate to start my answer with – it depends. But, it does depend. In my region, after the first year (when we dont expect a harvest), a healthy hive may produce about 2 boxes (shallow-medium) of honey. Other regions of the country produce much more – it depends on how long the warm season is and the availability of nectar. I check my hives twice a month in early spring – monthly during the summer and fall. Beekeeping involves hard work – I wont mislead you on that. However, if you prepare yourself by learning about hive management before your bees arrive, your chances of success greatly increase. Best of luck. I am a beekeeper in New Zealand, who works for a reasonably big company. I was fascinated by the apparent differences in beekeeping between America and NZ. 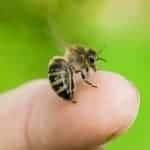 Here in NZ, it can be the hobbyists who pose the biggest risk, as we have certain plants that make a honey that is fine for the bees, and toxic for humans if it is eaten in raw, comb honey. Also, the company I work for doesn’t “superheat” the honey; its merely a case of the pipes being heated somewhat so that the honey doesnt granulate in the pipes, but moves freely. And the creamed honey has nothing added to it, so it is still completely natural. I’m not sure how that differs between the countries, or even between individual countries. It is always interesting to hear other beekeepers viewpoints and experiences. Yes, it absolutely depends on the company in question! I am sure that each one is processes honey differently and that some are much more concerned about the end product. Here we have creamed honey that is natural and some with flavorings – its quite good actually. Absolutely great information and thank you for sharing it. Thank you very much. Please join my email list. Thank you so much. You have no idea how much kind comments like this mean to me.